At Powell Picano we often take on furniture and cabinet making students for short-term internships. Students will often come to us from across Europe and spend anywhere from a few days to a few months with us in order to gain some experience and learn from our team of skilled makers and designers. We believe in real world, tactile making experience in order for students to get a real sense of the job and so while here students receive hands-on experience with live projects and learn about the design process, different making techinques and a variety of finishings. Those who have had interships with us have left with new found knowledge and experience of real furniture making, and more often than not we learn a lot from them too! John and everyone at Powell Picano were really welcoming and instantly made me feel part of the team. From the offset it felt like my contribution, however modest, was valued and appreciated. Every effort was made to clearly explain each task I was given and to ensure that I was also benefiting from my time with the company. It was great to see how a professional joinery business operates, especially one with such a clear focus on quality and attention to detail. Everyone was passionate about their work and took pride in creating high end products. The small size of the team also makes for a more personal and rewarding experience as an intern. A highlight for me was to come on site and see the initial stages of a kitchen fitting towards the end of my internship. Overall It was a great experience and a valuable addition to my furniture design and making studies. It was also an added bonus to meet a fantastic bunch of people! Thanks guys! When I decided to change career and was considering to retrain as a furniture maker, I was lucky to find the Powell Picano team. Upon my request they invited me to their workshop so I could have a look and a first experience of the life within a commercial furniture workshop. My day there, and discussion with the different people of the team convinced me that it was the right path for me. I joined the Building Crafts College in Stratford, London, and did a two year course in Fine Woodworking. In my first year, I contacted Powell Picano again and spent a total of six weeks as an intern with the team. It was great to be part of the working environment and apply what I was learning at school, see the differences, watch large pieces of fitted cabinetry being made, use new materials, experiment new finishes, etc... Everyone made me feel like I as part of the team. The fact of being around and see what was happening in the design process, the technical drawings, the making techniques, allowed me to learn a lot. During my second year at school, I had to design and make my own pieces of furniture. In one of them I incorporated red Valchromat which I discovered during my internship and used finishes that I had seen there as well. At the end of my second year, I was really pleased to see the team coming to New Designers and see my work being exhibit and even if they could not offer me an employment after my graduation, John recommended me to another company and help me to secure a job! If it was not for Powell Picano, my woodworking career would have been completely different. Before I joined my school, if I had ended up in a bad workshop with an unpleasant team I might have never start my woodworking career. Powell Picano team welcomed me and shared their knowledge with me. I will be forever thankful for that. Powell Picano Ltd kindly offered me a two-week work experience opportunity last Summer, in between year one and two of my Fine Furniture Diploma course. I found them very encouraging from the outset and they took an awful lot of trouble in giving me experience and opportunities to learn. They are a very friendly team who are obviously very enthusiastic in what they do. As a woman going into this profession, I was particularly pleased (and relieved) that they demonstrate a very strong equality ethic which makes a considerable difference when you are not feeling confident as it is!! I learnt a lot in that fortnight, and I would highly recommend any new starter to take any opportunities with them that comes their way. Leon did and internship with us last summer as part of his degree from the HMC furniture school in Amsterdam, Netherlands. We were impressed with Leon’s skill level, confidence and singing voice, so when he applied for a full time position as a graduate, we were happy to take him on. Bespoke mid century inspired style bathroom vanity unit in solid and veneered Oak with spray lacquered fronts and white Minerva Carrara counter top made in our North London workshop! Close up detail shot of our Swedish Sideboard - the leg frame of this piece is solid European oak, whilst the cabinet itself is constructed from custom veneered panels. This is our handmade, bespoke Swedish Sideboard. Our client came to us with a photo of a beautiful mid-century sideboard designed by Erik Worts and produced by IKEA in Sweden in the 1960's. The dimensions of the piece didn't suit, and the sideboard was in an auction house in Sweden, so we were commissioned to make a custom reproduction of sorts adding our own design touches but keeping to the spirit of the original. The low sideboard at our Ealing Common project. The counter top is made from fire proof Lapitec material. This low level sideboard at our Ealing Common project houses AV equipment and has two fall flap cabinets, and two drawers. 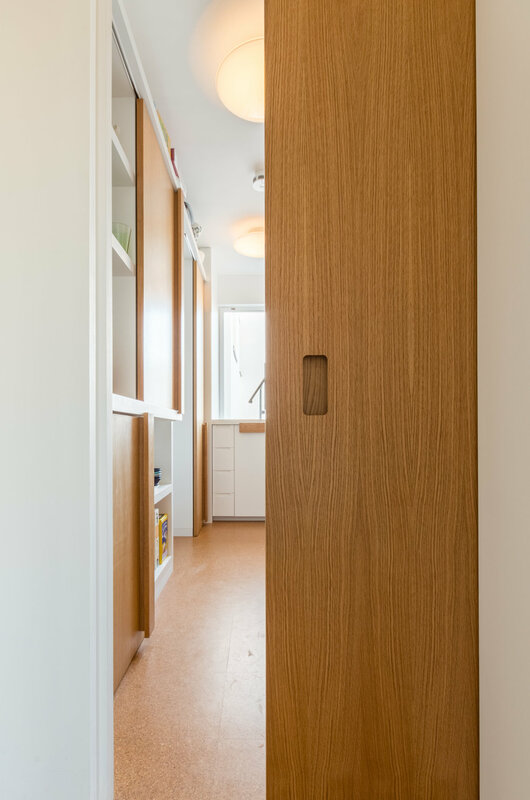 The second is a run of floor to ceiling cabinetry which provides cloakroom storage, and a pull-out desk. the unit has a set back plinth fascia to allow it to 'float' off the concrete floor. In this stunning ground floor Victorian conversion, we were commissioned to make two bespoke pieces to complement our clients beautiful mid century furniture whilst blending in with the contemporary style of the build. The first, a low level sideboard housing AV equipment has two fall flap cabinets, and two drawers. We recently worked with Goodhood producing their main cashier area from Corian and melamine faced birch ply. We also made some display stands in birch ply and softwood.